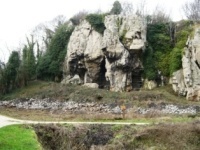 A short distance from the M1 motorway near Nottingham is an ancient limestone gorge, honeycombed with caves, where archaeologists have found traces of Ice Age inhabitants who lived here up to 50,000 years ago. The Cresswell Crags are a rare site, featuring Britain's only known Ice Age-era rock art. At the east end of the gorge visitors can find out its archaeological significance at a museum and education centre, equipped with several high-tech interpretive exhibitions. The area itself can also be explored, rewarding visitors with its sweeping views and interesting rock formations; while actual tours of the caves are run on weekends and during school holidays only. Check the website for details.